They are a vital link to our past. They teach us how to interact with older generations. They share their wisdom and their memories with us and love us unconditionally. Sometimes when parents are absent they become parents too. 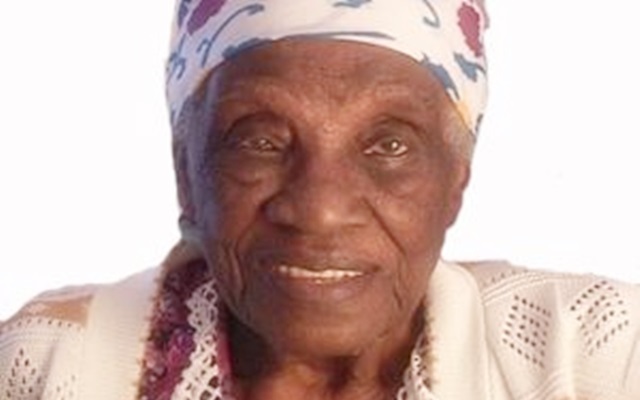 This International Women’s Day is in celebration of grandmothers everywhere and I am dedicating this article to my late maternal grandmother, Wilhelmina Harriott. I first met my grandmother aged four in 1968 and one of my favourite pictures is the one on the left, which was taken on the steps of our family church by a professional phorographer. 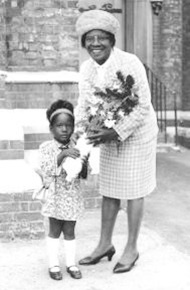 My grandmother had flown over from Jamaica to spend a year in England to be with her children, as by this time her eight surviving sons and daughters had all emigrated and were living in the United Kingdom. I remember an elegant, well-spoken and very loving woman that everyone wanted to be around – and wherever she went there was laughter. When we met again almost thirty years later nothing had changed. I arranged to visit Jamaica for the first time ever in 1998, two years after my mother died, as my maternal grandfather was due to celebrate his 100th birthday. But God had other plans, my grandfather died two days before I arrived and just two weeks away from his 100th year. I was expecting a very miserable and mournful atmosphere at my Aunt Jean’s house, where my late grandfather and grandmother lived, in Manchester, Jamaica. They had left their home in England some twenty years before to care for our grandparents – and care they did. Thanks to their love and kindness, my grandparents had very happy lives in their twilight years. The time we spent together for those two weeks were memorable, but easily surpassed by the time I spent with her when I returned to Jamaica in 2002, this time for a two-year stay. We had so many special times together. We used to sit snuggled up together on the veranda watching people go by. My grandmother knew everyone and everyone’s business and it was amusing to learn what people were up to – like the continuing episodes of a soap opera. My grandmother looked so much like my mother, whom she had out-lived, save for the wrinkles that more than a century had etched into her face. She had the same loving, kind nature and gentleness that always made me want to cuddle and kiss her, as I did my mother when she was alive. I remember one day when we were on the veranda and my grandmother had nodded off and her head was resting on my shoulder. The beautiful red and orange hues of the sunset painted the sky and I remember thinking to myself that I would cherish that moment forever. But at the same time, because I knew one day I would not be with my grandmother I felt sad and wept quietly so she couldn’t hear me. On more than one occasion when my grandmother used to retire to her room for the evening we would sit with our feet up on her bed, chatting away until we both fell asleep. She was a vital link to the past. She had an incredible memory and could recall the smallest details about events that took place decades ago. For example, she recalled how when she was 10 year’s old she went live with her sister, Georgiana, who was living in Panama at the time. Ten years later as a young woman she went to work in Cuba for a wealthy family and looked after two young children who came to adore her. There she met my grandfather, Hubert Harriott, who was a groom and looked after the family’s horses. “He really cleaned the saddles well,” my grandmother said fondly. They fell in love and got married in Cuba, and it was there that my late mother, Daphne, was born and one of my uncles, Vernal. My grandmother was happily married for over 80 years and often spoke of the deep love she shared with my grandfather. “We never had a cross word…he was a lovely man,” she used to say. Now that my grandmother has passed from this earthly dimension, her spirit and her love are always with me and I am always determined to live up to her high expectations of me, to honour her memory. It is right that we celebrate grandmothers on International Women’s Day, as not only are they a link to the past – studies have shown that their presence when children are growing up, contribute to the health and survival of future generations. A study by University College in London published in the Royal Society Journal in 2000 revealed that in Gambia, maternal grandmothers improve not only the nutritional status but also the survival of children. The study found that this was only the case with maternal grandmothers. Although children living with paternal grandmothers were taller and heavier than those without paternal grandmothers during the first year of their lives, this was not the case in later childhood. But the presence of grandmothers during the second year of a child’s life significantly increased the chance of survival. Grandchildren also benefitted from greater fitness levels from the presence of their grandmothers. A similar study carried out in Senegal published in the Social Science and Medicine journal in 2004, also found that grandmothers play an influential role in the household and on child health matters. 2 March 1902 – 9 December 2005. Hi Debbie, we all read the article you done about grandma, oh! it was well put together wonderful. The video was even great. Will have to get in touch with you, to have a chat about this.